The crucial National Highway between Chandigarh and Ludhiana is all set to be 8 laned with Union Government giving its nod for the execution of this critical project. This was informed by the representatives of National Highways Authority of India, who called on Punjab Deputy Chief Minister, Sukhbir Singh Badal to review the progress of ongoing National Highways in the state. They said that Union Surface Transport Ministry has given in-principle approval to this project and final decision would be taken on the detailed project report submitted by the Punjab Government. Earlier, the Punjab Deputy Chief Minister, Sukhbir Singh Badal put the Highway Projects on fast-track, fixing the timelines for the completion of each project, clearing hurdles coming in the way of the expeditious completion and made the authorities accountable for time-bound completion of projects. In a high level meeting, in which Regional heads of National Highways Authority of India, Western Command Representatives, Deputy Commissioners of all concerned districts besides Principal Secretaries of PWD (B&R), Forest, Environment and other concerned ministries participated, Badal reviewed the progress of each and every ongoing National Highway project. He went into the details of 6 laning of NH-1, 6 laning of Jalandhar-Dhilwan section NH-1, 4 laninig of Jalandhar-Pathankot NH-1A, 4 laning of Pathankot Amritsar NH-15, 4 laning of Ludhiana-Talwandi NH-95, 4 laning of Kurali-Zirakpur NH-21 and Ambala-Chandigarh section of NH-152. Badal said that he would coordinate with Army authorities for acquisition of 400 Acre land at Jalandhar for 6 laning on NH-1 and Deputy Commissioner Jalandhar was asked to remove encroachment near PAP Chowk for early completion of ROB. It was decided to have an additional entry and exit point in Ludhiana on NH-1. 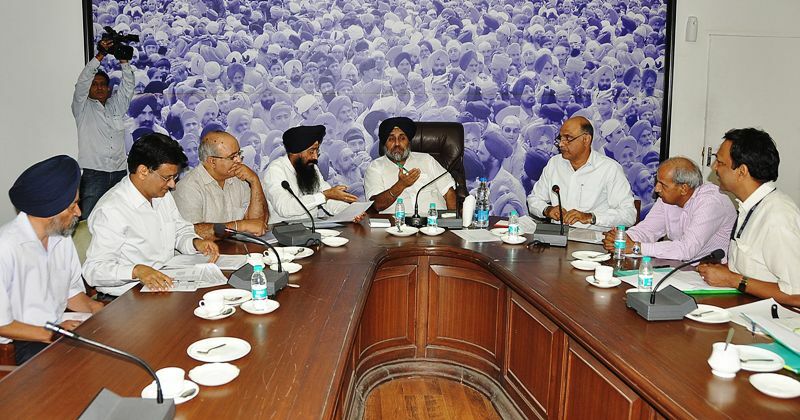 Expressing concern over slow disbursement of award money, instructions were issued to SDMs of Rajpura, Fatehgarh Sahib, Ludhiana West, Ludhiana East, Payal, Phagwara and Phillaur to complete the disbursal within 10 days. Reviewing the progress of 6 laning of Jalandhar-Dhilwan section, DC Jalandhar was asked to sort out compensation issue of Kartarpur belt. Similarly, in the case of 4 laning of NH-1A (Jalandhar-Pathankot Road) PWD assured that it would handover PWD land in village Dhakki shortly to NHAI and Defence authorities also assured transfer of 48 acre land near Phillaur and Nangal. It was decided to construct one under path near village Cholang and the Punjab Deputy Chief Minister asked DC Pathankot, Gurdaspur and Amritsar to sort out the problems of missing khasras. The Powercom was asked to shift lines coming in the way of National Highway. Expressing concern over slow progress of 4 laning of Ludhiana-Talwandi section NH-95, the Financial Commissioner Forest was asked to resolve the Forest issue and Principal Secretary Irrigation was also asked to finalise the design of bridges on the highway. Underlining the need for expediting 4 laning of Kurali-Zirakpur section of NH-21, Deputy Commissioner of Roop Nagar was asked to expedite the acquisition process and Excise and Taxation Department was also asked to shift their barrier. The Deputy Chief Minister also emphasised the need for early completion of Ambala-Chandigarh section of NH-152. Prominent amongst others who attended the meeting included ; Sharanjit Singh Dhillon, PWD Minister, P.S Aujla, Principal Secretary to Deputy Chief Minister, Ajay Kumar Mahajan, Special Principal Secretary to Deputy Chief Minister , representatives of NHAI, Defense, Forest, Power, Irrigation and Sewerage departments besides Deputy Commissioners of Amritsar, Jalandhar, Pathankot, Gurdaspur, Rupnagar and Moga.